The 1962 World Series matched the defending American League and World Series champions New York Yankees against the National League champion San Francisco Giants, who had won their first NL pennant since 1954 and first since moving from New York in 1958, defeating the Los Angeles Dodgers in a three game playoff. 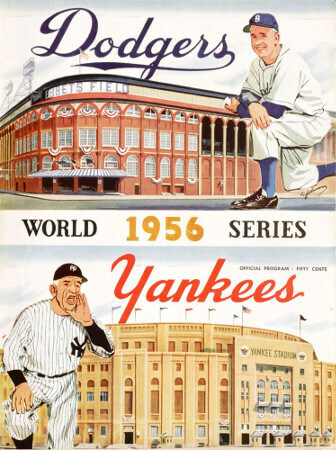 The 1961 World Series matched the New York Yankees (109–53) against the Cincinnati Reds (93–61), with the Yankees winning in five games to earn their 19th championship in 39 seasons. This World Series was surrounded by Cold War political puns pitting the “Reds” against the “Yanks”. But the louder buzz concerned the “M&M” boys, Roger Maris and Mickey Mantle, who spent the summer chasing the ghost of Babe Ruth and his 60 home run season of 1927. Mantle finished with 54 while Maris set the record of 61 on the last day of the season. With all the attention surrounding the home run race, the World Series proved almost anti-climactic. The 1958 World Series was a rematch of the 1957 Series, with the New York Yankees beating the defending champion Milwaukee Braves in seven games for their 18th title, and their seventh in 10 years. With that victory, the Yankees became only the second team in Major League Baseball history to come back from a 3–1 deficit to win a best-of-seven World Series; the first was the 1925 Pittsburgh Pirates. The 1903 Boston Red Sox came back from a 3–1 deficit in a best-of-nine affair. Both teams would meet again in the fall classic thirty-eight years later by that time, the Braves had moved to Atlanta. The 1956 World Series of Major League Baseball was played between the New York Yankees (representing the American League) and the defending champion Brooklyn Dodgers (representing the National League) during October 1956. The Series was a rematch of the 1955 World Series. It was the last all New York Series until 2000; the Dodgers and the New York Giants moved to California after the 1957 season.